No, this is not a lair for some Halloween haunted house, even though it does look pretty spooky. As I was returning to my hotel after visiting the World Center for Birds of Prey outside of Boise, ID I noticed a bridge along the highway that crossed over a large dry creek. Always on the lookout for bat habitats I immediately pulled over, grabbed my camera, and headed down under the bridge. Although I did not find any chiropteras hanging about the underpass I did see something just as intriguing. 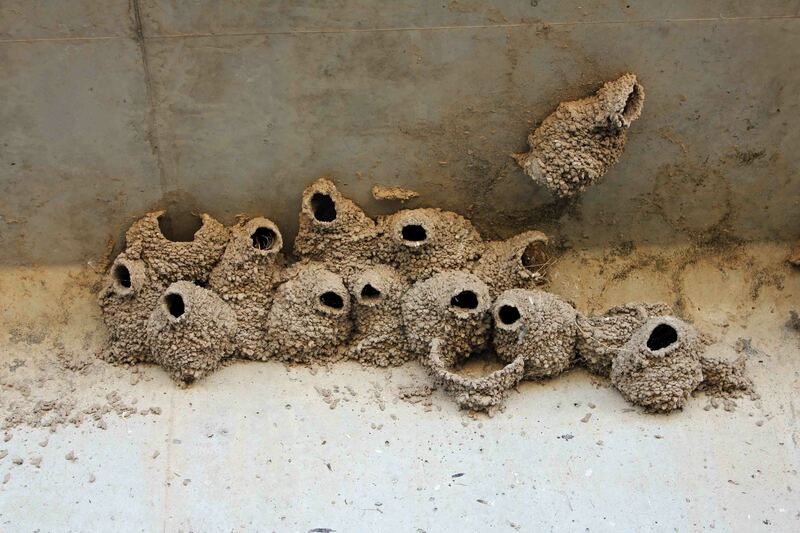 At first I thought I was seeing an elaborate display of mud dawber wasps. On closer inspection, however, these were obviously not wasp nests. To begin with there were no wasps in sight and the wide entrances to these unique structures did not seem appropriate for these insects. Wasp nests do not contain feathers either and these muddy structures had plenty. Unfortunately, none of the feathered inhabitants were present during my visit. A bit of quick research later revealed the identity of the mysterious builders – “Mud Swallows.” More properly called Barn Swallows, Hirundo rustica, they build these unique nests out of mud reinforced with grass and feathers. I understand their industrious construction efforts can even be quite a nuisance in some places. I am thoroughly familiar with the Purple Martins that come to nest in our eves every spring but these Barn Swallow nests were a first for me. In fact, the gentlemen who lived right across the street from the bridge had never seen them either; he was pretty surprised when I showed him the pictures. So the next time you happen to near an underpass or bridge don’t hesitate to climb down and take a look. You never know what you’ll find!